← Severe MCS/ES… What Does It Mean? Yet, even if he didn’t say it, the words are true! Without a clean healthy environment, without clean air and water, without unpolluted food (all provided by mother earth with a bit of attention from ourselves) we cannot possibly be healthy ourselves. What we do to the air, water, food, and planet, we do to ourselves. 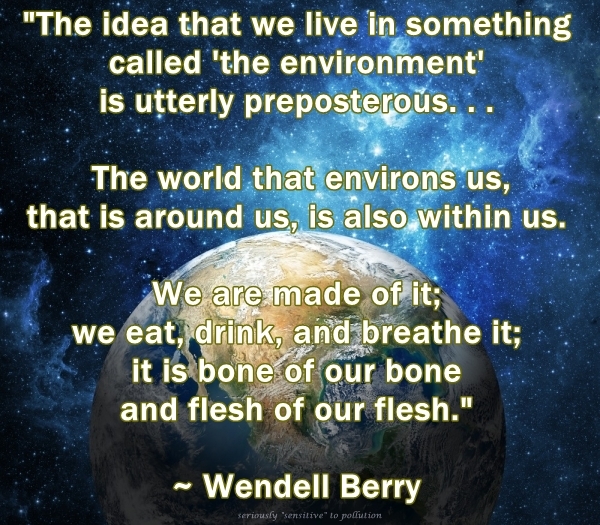 This entry was posted in Environmental Health, Healthy Environment, Interconnectedness and tagged Bill Moyers, environment, healthy environment, Wendell Berry. Bookmark the permalink. Wonderful. If only people will listen to his wisdom. That is true Cristianity ♡ If only we weren’t so easily MISLEAD!